Slim Devices Squeezebox is networked media player and streamer that stream digital music and Internet radio from the SlimServer PC to the stereo so that you can easily access any song in your music collection, from any room in your home. Slim Devices Squeebox features remote control, a high fidelity 24-bit Burr-Brown DAC, where digital optical, coax, and analog connectors can plug into any home theater, stereo or amplified speakers. Beside, Squeebox also has built-in support for 802.11g Wi-Fi and serves as wireless bridge thru its Ethernet port. TrustedReviews reviews Slim Devices Squeezebox and concludes with overall rating of 9 out of 10 that this thing support a wide array of music formats. Not only does the Squeezebox support the usual lossy formats – MP3, WMA, AAC and Ogg Vorbis – but it also support a wide range of lossless file formats, including raw PCM, AIFF, WAV, FLAC, and both Apple and WMA lossless standards. 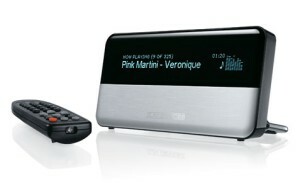 It won’t be for everyone, but with the Squeezebox Slim Devices has most of the wireless music bases covered. Not only is it good to listen to with the right kit, it is also very easy to use and has a myriad of ingenious features. Sure it can’t quite match the elegance of design, engineering and sheer desirability of a Sonos system but Slim Devices’ little Squeezebox is a masterpiece of innovation and well worth the money.